List Rules Vote up the most compelling evidence The Shining is a comedy. Despite all the plaudits Stanley Kubrick’s horror classic receives, The Shining isn't scary. It has all the trappings of a horror movie, to be sure: foreboding music, ghostly characters, and good old-fashioned murder. Do not be fooled by this. A deeper look at the film reveals The Shining is a comedy and, in fact, fits right in with the dark tone of other Stanley Kubrick comedies. In many ways, The Shining can be viewed as a parody of horror films. But that’s not the only thing that places the film on the robust list of comedies you thought were horror movies. There are portions of the film that are outright, laugh-out-loud funny. There is little doubt these sections were purposely played for laughs by Kubrick. There's no shortage of theories about Stanley Kubrick movies and or interest surrounding the making of The Shining in particular. Take a look at the evidence, re-watch the movie, then decide for yourself. The only character to die during the runtime of the film besides Hallorann is Jack Torrance, after he is outsmarted in a hedge maze by his five-year-old son. Lost in the hedge in the dead of winter, Jack freezes to death. The image of Jack’s frozen corpse the next morning isn’t so much a grizzly vision of death by nature’s cruel hand as a potential punch line to a sketch comedy bit. There is never any doubt Jack Torrance (Jack Nicholson) is a maniac. He just barely holds in his insanity during his job interview at the beginning of the film. This did not go unnoticed by Stephen King, author of the novel on which the film is based. Straight away, you can see the film is operating on the level of parody. Rather than being a film about what drives a man to such depths of insanity that he kills his family (something truly terrifying), it’s about a cartoonishly crazy person working himself up to finally kill his family (more funny than terrifying). 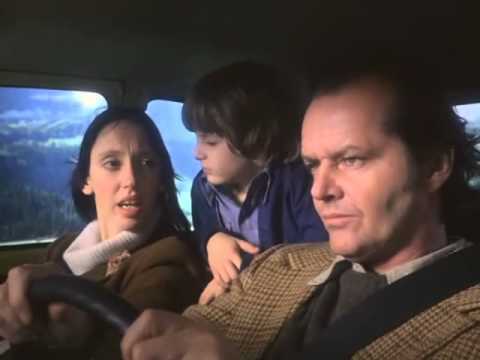 When he drives his family to the Overlook Hotel at the start of the winter, Jack discusses the Donner Party and their cannibalistic habits with his wife and child. This is done in such an off-handed way it comes off as tongue-in-cheek. The scene doesn't elicit the chills you might expect in a scene foreshadowing doom. Instead, it leaves you feeling bewildered, unless you realize you're actually watching a comedy.